70 games in 74 days – the Generals deserve a break – the players, coaches, and sure, even the broadcaster. To say the first half of the 2012 Southern League season was successful for the Jackson Generals is an understatement. They finished the first half with a 42-28 record, the best in the Southern League and as North Division first half champions. The 42 wins are the third-most in a first half in franchise history and most since 2006. They did it with exceptional pitching and timely hitting. They did it with Joe Dunigan home runs that bounced off the top of the scoreboard. They did it despite a bevy of injuries to key players like first baseman Rich Poythress, outfielders Daniel Carroll and Johermyn Chaves and highly touted pitching prospect James Paxton. They did it with the help and support of more fans coming out to games this year than we have seen in years. The first half has been special. Despite the weary eyes of players and staff from the tiresome journies of a minor league season, everyone is walking with a bit of a swagger. During the next few days, seven Generals will get to experience what it is like to play in an All-Star game. Danny Hultzen, who has been the best pitcher in minor league baseball, will throw the first pitch of the game on Tuesday night at Smokies Park, promptly at 7:15 EST. Center fielder Denny Almonte will lead off for the North team, while Nick Franklin will bat third and play short stop and Jesus Sucre will hit fifth and catch. 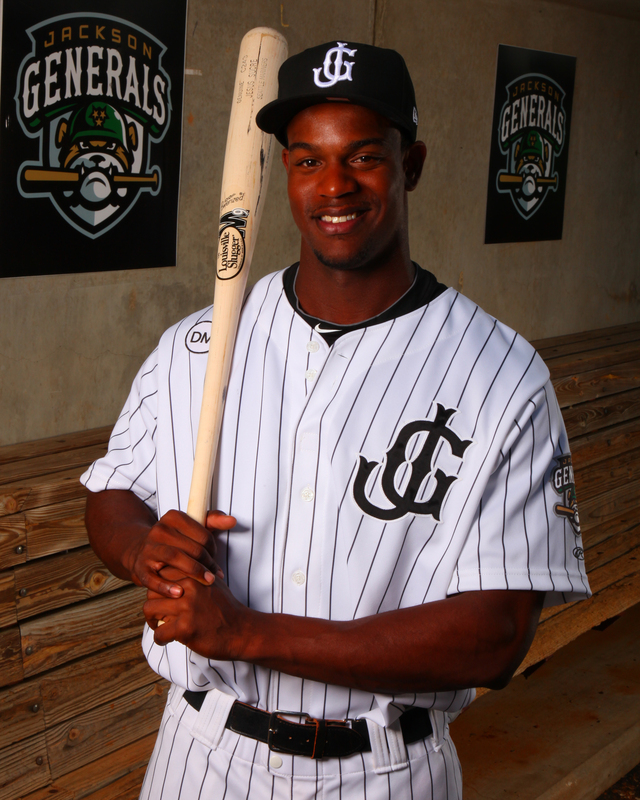 Joining those Generals in Kodak, TN Tuesday are outfielder Joe Dunigan and pitchers Carter Capps and Taijuan Walker. An hour before the All-Star game, Dunigan and Almonte will exhibit there power hitting skills in the Home Run Derby. This is just the midway point of the journey. What will the second half hold? No doubt the Generals will have to do it without a few top prospects that advance their career to Triple-A or the majors. That is part of the business and the fun part. We will get to watch them make their major league debut like Stephen Pryor did a month ago. Watch from afar as a former General like Pryor earned the win during a no hitter against the Los Angeles Dodgers 10 days ago. The second half offers opportunity. Can Poythress and Chavez help the lineup be more productive? Can James Paxton be healthy and return to the form at the beginning of the season? Can 19-year-old Taijuan Walker make the next step as a pitcher in his career and dominate the Double-A level? 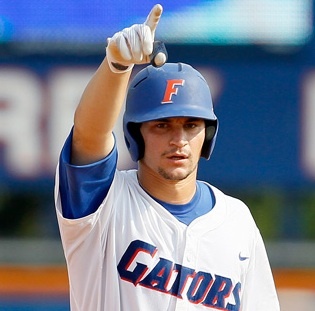 Will top draft choice and current Florida Gator catcher Mike Zunino join the Jackson Generals at some point? All of these questions will be fun to answer in the coming weeks and months. The Generals have guaranteed themselves home field advantage in the first round of the Southern League playoffs, but can they finish it off with a title? For three days at least, we can enjoy the All-Star break and think back to a first half full of memories. “There was a lot of hype and expectations coming into the season and this team certainly did not disappoint,” said Manager Jim Pankovits. “From day one, these players worked extremely hard and they got what they deserved which was a first half championship. GENERALS RECAP: The Generals lost their second straight Saturday night to Chattanooga, 4-2. The Lookouts victory tied the series at 2-2. Jackson (41-28), despite the loss still maintains the best record in the Southern League. RH Forrest Snow (0-1, 1.59) made his first start in Double-A, taking the loss, pitching 5.2 innings, allowing 2 runs, 4 hits, and striking out 4. 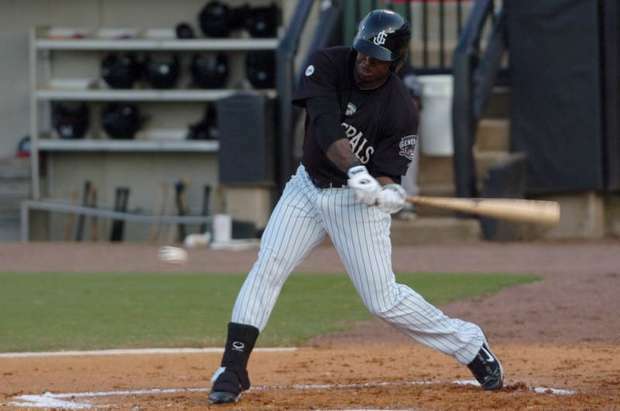 DH Joe Dunigan blasted his 12th HR of the season in the 8th inning and 3B Leury Bonilla finished the night 2-for-4, while LF Chris Pettitwas 2-for-5 in the losing effort. FIRST HALF CHAMPIONS: The Generals clinched their first division championship on Monday night in Jacksonville. Jackson clinched with 5 games remaining in the half. The 41 wins so far ranks T-3rd in franchise history in the 1st half and first since 2008. HR DERBY ADDS SOME “COOL BREEZE” & “GI JOE”: The Southern League Home Run Derby at Smokies Park will featuire Generals’ Denny Almonte (9 HR) and Joe Dunigan (12 HR). 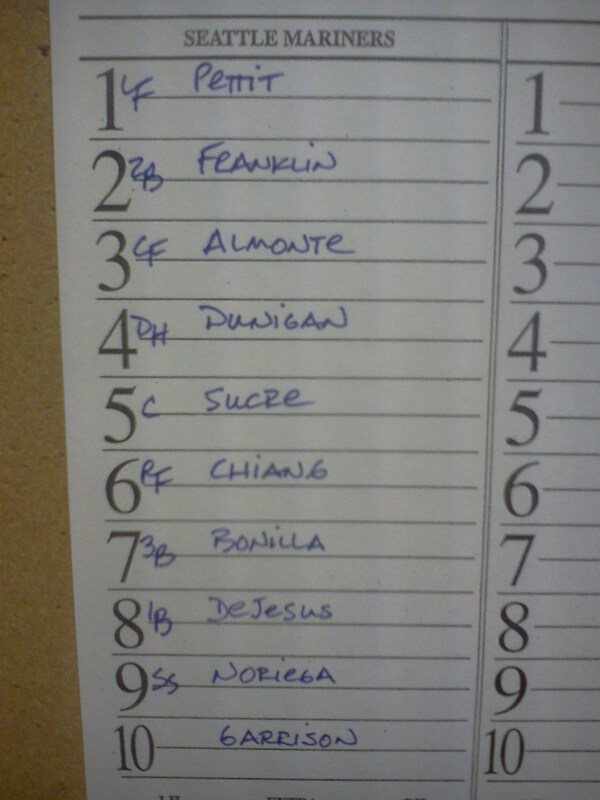 Almonte will also be the leadoff hitter in the game Tuesday night. WHO’S HOT? : OF Chris Pettit is batting .360 (9×25) during his current 5-game hit streak, with 4 doubles, 5 runs and an RBI. -> LH Brian Moran has held opponents scoreless in 19 of 23 relief appearances this season. He is currently 1-2 with a 1.15 ERA (4 ER, 31.1 IP). He has walked 6 and struck out 27..
CHIANG DESIGNATED FOR ASSIGNMENT: In order to make room for LH Oliver Perez on the Mariners 40-man roster, OF Chih-Hsien Chiang has been designated for assigment. If Chiang clears waivers, he could return to the Jackson active roster. Chiang was on a 4-game hit streak batting .471 (8×17), with 4 doubles, 8 RBI and 2 runs in those games. 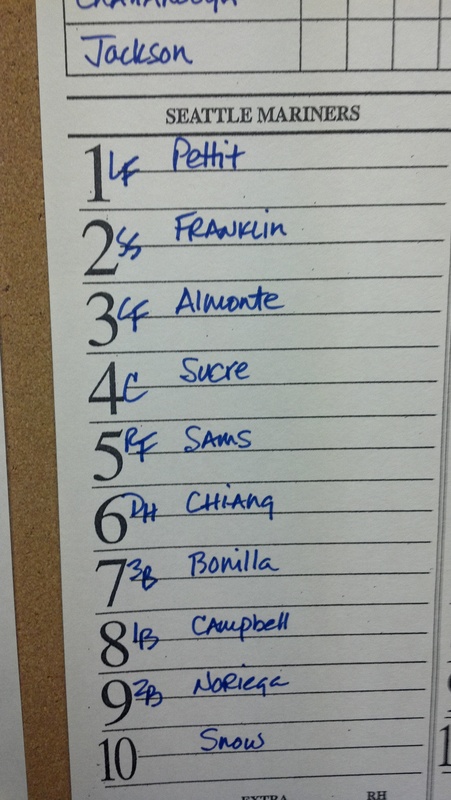 TODAY’S GAME: The Generals meet Chattanooga (LAD) tonight in game 4 of the 5-game set at Pringles Park. With Jackson leading the series, 2-1, the Generals look to take the series. Jackson leads the season series over Chattanooga, 6-2. GENERALS RECAP: The Generals had their 3-game win streak snapped Friday night, despite a valiant comeback against Chattanooga, 11-10. Jackson scored 4 runs in the ninth and stranded the tying run at second base. RH Taijuan Walker (3-4) suffered the loss, allowing six runs on six hits over 3.2 innings of work. Walker struck out 4 and walked 3. RF Chih-Hsien Chiang was 2-for-4 with two doubles and a season-high 5 RBI. LF Kalian Sams, C Ralph Henriquez and 2B Eric Campbell each collected 3 hits on the night. The two teams combined for 21 runs and 28 hit. FIRST HALF CHAMPIONS: The Generals clinched their first division championship on Monday night in Jacksonville. Jackson clinched with 5 games remaining in the half. The 41 wins so far ranks T-3rd in franchise history in the first half and first since 2008. HOME SWEET…PRINGLES: Jackson has enjoyed lots of success at Pringles Park this season, going 22-11 at “The Big Chip”. That is the best home record in the Southern League. Jackson is 19-16 away from home. NO JUNE SWOON: The Generals have the best record in the league this season and the 2nd best start in the league during the month of June at 10-5. The Smokies are 11-3 during the month of June. THE INCREDIBLE HULTZ: Overall in 13 starts this season, Hultzen is 8-3 with a 1.19 ERA (10ER, 75.1 IP). He has limited opponents to a .151 average (38×252), while walking 32 and striking out 79. Hultzen currently leads the Southern League in ERA (1.19), strikeouts (79), opponents average (.151), WHIP (0.93), while leading all starters with the fewest base-runners per 9.0 innings (8.72). He also ranks T1st in the league in wins (8), T4th in innings pitched (75.1) and 4th in strikeouts per 9.0 innings (9.44). He has won his last 4 starts and has been named the starter for the North Division at the All-Star Game. GENERALS RECAP: The Generals won their third straight Thursday night, and second straight over Chattanooga, 2-1, in front of 3,226 fans at Pringles Park. The first-half Champion Generals are 15-games above.500 for the first time this season. LH Steve Garrison (4-3) won Thursday and tossed a season-high 7.0 innings, striking out a season-high 5 batters. Garrison allowed 1 run on 7 hits in the outing and snapped a 2-game losing skid on the mound. The Generals scored in the first on back-to-back doubles from LF Chris Pettit and SS Nick Franklin. Franklin’s RBI double put Jackson up 1-0. In the bottom of the fifth, DH Joe Dunigan smashed a solo home run that cleared the right-center field score board. Dunigan’s team-leading 11th blast of the year gave Jackson the eventual final score of 2-1. After a scoreless inning by LH Mauricio Robles, RH Carter Capps struck out 3 in the ninth and saved his 8th game of the season. The Generals won despite being out-hit by the Lookouts 7-6 and only one Jackson player recording a multi-hit game. RF Chih-Hsien Chiang was 2-for-4 to lead the way. WHO’S HOT? : C Jesus Sucre has hits safely in 13 of his last 17 games with 9 multi-hit contests. During this stretch (since May 23) he is batting .373 (25×65) with 5 runs scored, 1 double and 8 RBI. -> INF Nick Franklin hit safely 12 of his last 18 games, batting .328 (23×68) with 10 runs scored, 4 doubles, 2 triples, 2 home runs and 8 RBI. He currently ranks 1st in the Southern League in average (.325), while ranking 4th on-base percentage (.394) and 5th in slugging percentage (.510). CAPPING OFF GAMES: After last night’s save, RH Carter Capps has not allowed an earned run in his last 19.2 innings in relief (14 games). This season he is 2-2 with 8 saves and a 1.39 ERA (5 ER, 32.1 IP). He has limited opponents to a .185 (22×119) average, while walking 9 and striking out 50. Capps has held opponents scoreless in 20 of 23 relief appearances this season. His 13.92 strikeouts per 9.0 innings currently is 1st amongst relievers in the Southern League. ALL-STAR GAME HAS JACKSON FLAIR: For the 2nd straight year, a Jackson pitcher will throw the first pitch of the Southern League’s mid-summer classic. LH Danny Hultzen has been named the starting pitcher for the North Division All-Star team by Smokies manager Buddy Bailey. Last year Jackson pitcher Jarrett Grube started for the North when the game was held at Pringles Park. 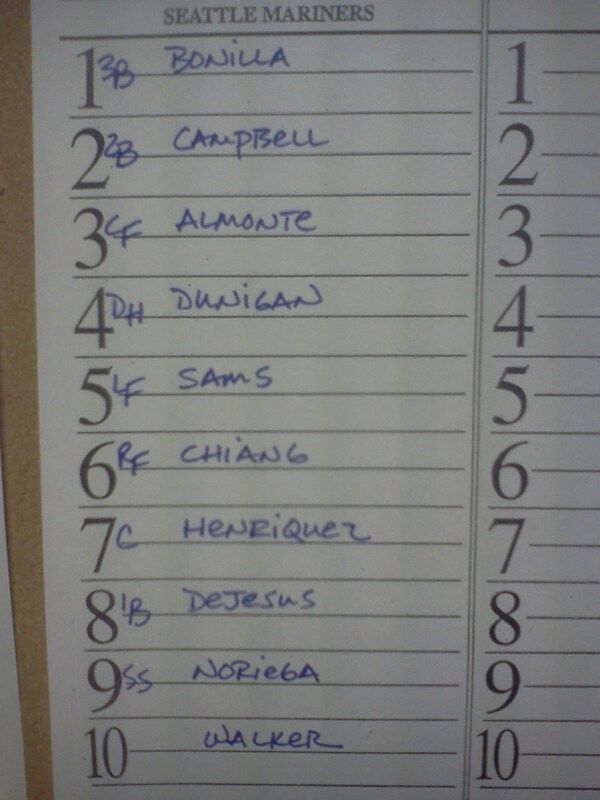 Hultzen is joined in the starting lineup by CF Denny Almonte, who will lead off for the North, SS Nick Franklin, who will bat 3rd and catcher Jesus Sucre will bat 5th. In total, 8 Generals were named to the North All-Star team: pitchers Carter Capps, Danny Hultzen, Bobby LaFromboise and Taijuan Walker, along with C Jesus Sucre, INF Nick Franklin, and OF Denny Almonte and Joe Dunigan. The 2012 All-Star Game will played on Tuesday, June 16 at Smokies Park in Kodak, TN, with first pitch at 7:15 p.m. EST. 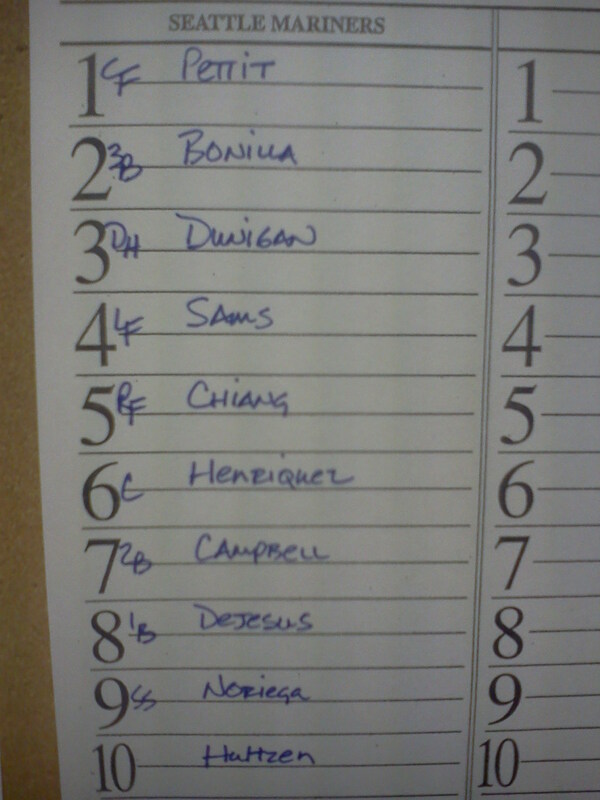 TODAY’S GAME: The Generals look to win their 3rd straight tonight in game two of the five-game series with Chattanooga. The Generals lead the season series, 5-1. Jackson has out-scored their opponents the last two games, 16-0. GENERALS RECAP: The Generals returned to Pringles Park Wednesday and blanked the Chattanooga Lookouts, 8-0. . The Generals (40-26) posted their 9th shutout of the season. The Generals hit the 40-win plateau for the first time in the first half since 2006. Danny Hultzen (8-3) won his fourth straight start on the mound and lowered his ERA to a league best 1.19. Hultzen tossed five shutout innings, striking out four and walking one, scattering four hits. Brian Moran and Yoervis Medina added two scoreless innings apiece to complete the 7-hit shutout. Six Generals recorded multi-hit games on Wednesday night. Chris Pettit, Leury Bonilla, Joe Dunigan, Eric Campbell, Chih-Hsien Chiang and Jharmidy De Jesus added two-hit performances. FIRST HALF CHAMPIONS: The Generals clinched their first division championship on Monday night in Jacksonville. Jackson clinched with 5 games remaining in the half. The 40 wins so far ranks 3rd in franchise history in the first half and first since 2006. FIVE TRANSACTIONS TODAY: The following roster moves were made today effecting the Generals. LHP Bobby LaFromoboise and RHP Steven Hensley have been promoted to Triple-A Tacoma and RHP Forrest Snow has been activated from Triple-A Tacoma to Jackson and RHP Andrew Kittredge has been activated from Low-A Clinton. Also, RHP Jandy Sena returns from Triple-A Tacoma and has been placed on the 7-day DL. WHO’S HOT? : C Jesus Sucre has hits safely in 12 of his last 16 games with 9 multi-hit contests. During this stretch (since May 23) he is batting .387 (24×62) with 5 runs scored, 1 double and 8 RBI. -> INF Nick Franklin hit safely 11 of his last 17 games, batting .338 (22×65) with 10 runs scored, 4 doubles, 2 triples, 2 home runs and 8 RBI. He currently ranks 2nd in the Southern League in average (.325), while ranking 4th on-base percentage (.394) and 5th in slugging percentage (.510). -> OF Denny Almonte currently has an 11-game hit streak with 5 multi-hit games, batting .370 (17×46) with 7 runs scored, 3 doubles, 1 home run and 3 RBI. He has also hit safely in 14 of his last 15 games, batting .400 (22×55) with 9 runs scored, 5 doubles, 2 home runs and 8 RBI. -> LH Brian Moran has held opponents scoreless in 18 of 22 relief appearances this season. He is currently 1-2 with a 1.19 ERA (4 ER, 30.1 IP). He has limited opponents to a .232 average (25×107) with 6 walks and 25 strikeouts. THE INCREDIBLE HULTZ: The two-time Southern League Pitcher of the Week Danny Hultzen upped his scoreless innings streak last night to 27.2 innings. Hultzen is now 8-3, with a 1.19 ERA. 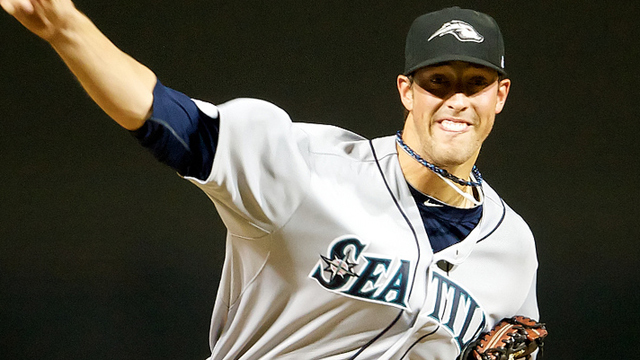 Hultzen leads the Southern League in wins (8), ERA, (1.19), strikeouts (79) and opponents batting average (.151). He has won his last 4 starts and has been named the starter for the North Division at the All-Star Game. TODAY’S GAME:Tonight the Generals return to Pringles Park to begin the final series of the first half. The Generals face the Chattanooga Lookouts for the 6th time this season tonight. The Generals took 4 of 5 from the Lookouts last week in Chattanooga. GENERALS RECAP: The Generals clinched their first division championship on Monday night in Jacksonville since 2008. The Generals won the Southern League North title, with five games remaining in the first half. After getting shutout in back-to-back games, Jackson shutout Jacksonville 8-0 on Monday night. Starter Brandon Maurer (7.1,6,0,0,1,7,WP,BK) and relievers Yoervis Medina (0.1,2,0,0,0,0), Bobby LaFromboise (0.1,0,0,0,0,0) and Carter Capps (1.0,0,0,0,2,1) limited the Suns to only 8 hits. 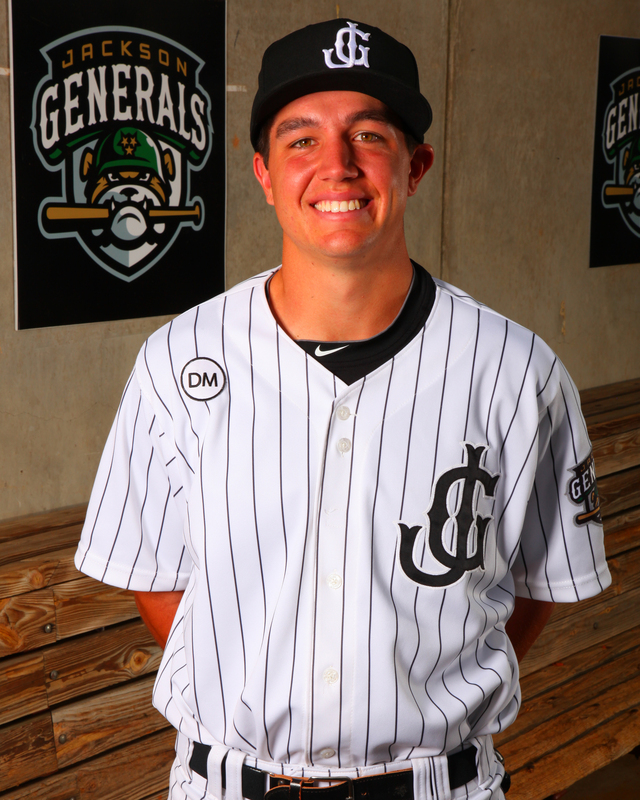 The Generals had 6 players record multi-hit games, including LF Chris Pettit (2×5, 2 R, 2 2B, RBI), SS Nick Franklin (2×5, R, SB), C Jesus Sucre (2×5, R, RBI), DH Joe Dunigan (2×5, 2 R, HR, 2 RBI), RF Chih-Hsien Chiang (2×4, R, RBI) and 2B Gabriel Noriega (2×4, R). Dunigan hit his 10th home run of the season, a 2-run shot in the 4th inning, and now leads the team in homers. FIRST HALF CHAMPIONS: The Generals clinched their first division championship on Monday night in Jacksonville. Jackson clinched with 5 games remaining in the half. The 39 wins so far ranks T-4th in franchise history in the first half. -> LH Brian Moran has held opponents scoreless in 17 of 21 relief appearances this season. He is currently 1-2 with a 0.127 ERA (4 ER, 28.1 IP). He has limited opponents to a .234 average (25×107) with 6 walks and 25 strikeouts. -> LH Bobby LaFromboise has allowed only 1 earned run in his last 24.1 innings in relief (0.37 ERA). During his last 17 relief appearances he has limited opponents to a .133 average (11×83), while walking 4 and striking out 27. He has not allowed a hit to the last 23 batters faced (1 BB, 8 K). 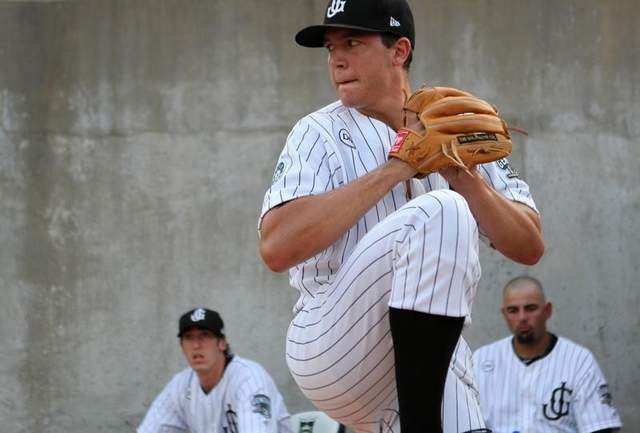 THE INCREDIBLE HULTZ: The Southern League announced Monday that Generals starting pitcher and 2012 Southern League All-Star Danny Hultzen was named Pitcher of the Week, for the second consecutive week. Hultzen, 22, made 1 start last week on Friday at Jacksonville, tossing 8.0 innings, allowing 0 runs on 2 hits while striking out 8 and walking just 1 batter. Hultzen has won his last 3 starts and has not allowed a run in his last 22.2 innings pitched. TODAY’S GAME: Tonight the Generals look to snap a 2-game losing skid against the Jacksonville Suns in the series finale. The Generals are 5-4 on the current 10-game road trip and 1-3 in the series against the Suns. The Generals magic number is at 3. 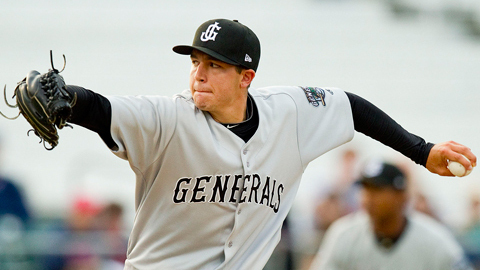 GENERALS RECAP: The Jackson Generals had been shutout only twice in 2012 prior to Sunday. Jacksonville went on to blank the Generals in the suspended game from Saturday, 7-0 and win the regularly scheduled game for Sunday, 9-0. The Suns win the series taking 3 out of 4. Steve Garrison (3-3) suffered the loss for Jackson and allowed 6 runs (4ER) on 7 hits in 3.1 innings pitched. in Saturday’s game. 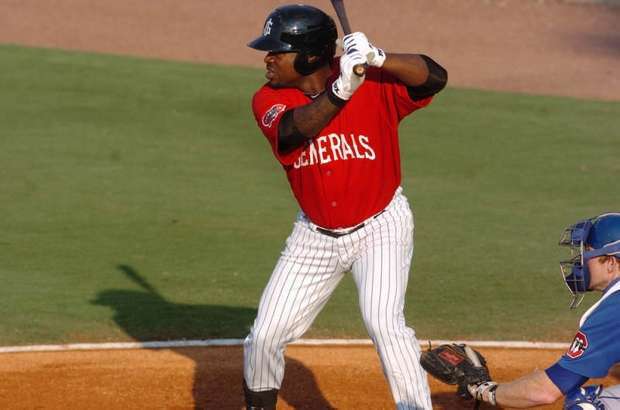 Leury Bonilla led the Generals at the plate by finishing 2-for-3. In Sunday’s game Taylor Stanton (1-2) suffered the loss for Jackson, allowing 8 runs (7ER) on 9 hits in 4.0 innings. Stanton struck out 3 and walked 3. Gabriel Noriega was 2-for-2 for the Generals in the losing effort. MAGIC NUMBER AT 3: The Generals have the best record in the Southern League, 38-26 and boast the best ERA in the league at 3.07. The next closest is Tennessee with a 3.56 team ERA. The magic number to clinch the North Division title is 3. WHO’S HOT? : C Jesus Sucre has hits safely in 11 of his last 15 games with 8 multi-hit contests. During this stretch (since May 23) he is batting .386 (22×57) with 4 runs scored, 1 double and 7 RBI. -> OF Denny Almonte currently has a 10-game hit streak with 5 multi-hit games, batting .421 (16×38) with 6 runs scored, 2 doubles, 1 home run and 2 RBI. The 10-game hitting streak is the 2nd-longest by a Generals this season (Poythress, 11G). -> LH Bobby LaFromboise has allowed only 1 earned run in his last 24.0 innings in relief (0.38 ERA). During his last 16 relief appearances he has limited opponents to a .134 average (11×82), while walking 4 and striking out 27. He has not allowed a hit to the last 22 batters faced (1 BB, 8 K). INCREDIBLE HULTZ TAKES LEAGUE HONOR…AGAIN: The Southern League announced today that Generals’ starting pitcher and 2012 Southern League All-Star Danny Hultzen was named Pitcher of the Week, for the second consecutive week. Hultzen, 22, made one start this week on Friday at Jacksonville, tossing 8.0 innings, allowing no runs on two hits while striking out eight and walking just one batter. Hultzen has won his last three starts and has not allowed a run in his last 22.2 innings pitched. The lefty is 7-3 with a league-best ERA of 1.28 (10 ER, 70.1 IP). He also leads the league in opponent’s batting average (.145), WHIP (0.92), while leading all starters with the fewest base-runners per 9.0 innings (8.70). He also ranks tied for second in the league in wins (7), second in strikeouts (67) and fourth in strikeouts per 9.0 innings (9.60). The Bethesda, MD native’s last start of the first half is scheduled for Thursday night at Pringles Park, as Jackson takes on the Chattanooga Lookouts. TODAY’S GAME: Today, the Jackson Generals will complete Saturday’s game and then play the regularly scheduled Sunday game afterword. Game two will be a 7 inning game. 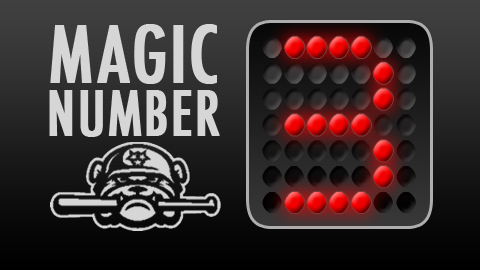 The Generals magic number to clinch the North Division title is down to 3. 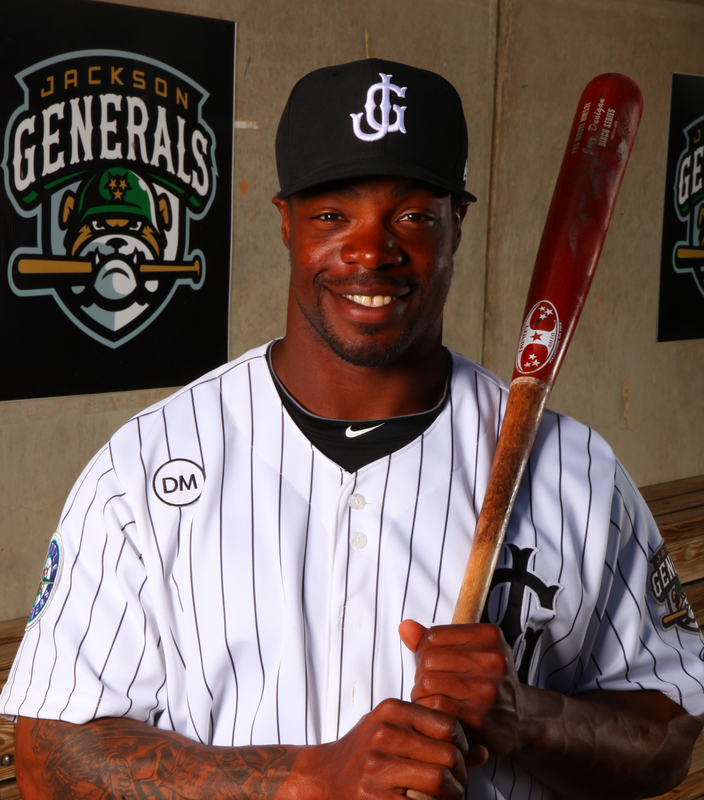 GENERALS RECAP: With the Jacksonville Suns leading the Generals 4-0 in the bottom of the fourth inning, the game was delayed and eventually suspended due to heavy rain. Jacksonville struck first in the bottom of the first on a sacrifice fly by Shawn Bowman. The Suns took the early 1-0 lead. The Suns struck for 3 more runs in the second inning, capped off by a 2-run home run for Donnie Webb against Generals starter Steve Garrison. Jacksonville led 4-0 as the game was suspended in the bottom of the fourth, with one out. TOPS IN THE LEAGUE: The Generals have the best record in the Southern League, 38-24 and boast the best ERA in the league at 2.93. The next closest is Mississippi with a 3.56 team ERA. THE INCREDIBLE HULTZ: After allowing 5 runs in 4.0 innings in his first start of the season, LH Danny Hultzen has allowed only 5 earned runs in 66.1 innings (0.68 ERA), lowering his ERA from 11.25 to 1.28 ERA in last 11 starts. During this stretch he has limited opponents to a .142 average (31×219), while walking 27 and striking out 68. Overall in 12 starts this season, Hultzen is 7-3 with a 1.28 ERA (10 ER, 70.1 IP). He has limited opponents to a .145 average (34×235), while walking 30 and striking out 75. Hultzen currently leads the Southern League in ERA (1.28), opponents average (.145), WHIP (0.92), while leading all starters with the fewest base-runners per 9.0 innings (8.70). He also ranks T2nd in the league in wins (7), 2nd in strikeouts (67) and 4th in strikeouts per 9.0 innings (9.60). CAPPING OFF GAMES: RH Carter Capps has not allowed an earned run in his last 17.2 innings in relief (12 games). This season he is 2-2 with 7 saves and a 1.48 ERA (5 ER, 30.1 IP). He has limited opponents to a .195 (22×113) average, while walking 7 and striking out 46. Capps has held opponents scoreless in 18 of 21 relief appearances this season. His 13.65 strikeouts per 9.0 innings currently is T1st amongst relievers in the Southern League. ELITE EIGHT ALL-STARS: Eight players from the Generals will represent the North Division in the 2012 Southern League All-Star Game at Smokies Park, the most of any team in the league. Pitchers Carter Capps, Danny Hultzen, Bobby LaFromboise (added Thursday) and Taijuan Walker were all named to the North pitching staff after leading Jackson to a league-leading team ERA this season. Catcher Jesus Sucre, infielder Nick Franklin, and outfielders Denny Almonte and Joe Dunigan were also named to the squad. The 2012 All-Star Game will played on Tuesday, June 16 at Smokies Park in Kodak, TN, with first pitch at 7:15 p.m. EST. WHO’S HOT? : C Jesus Sucre has hits safely in 11 of his last 14 games with 8 multi-hit contests. During this stretch (since May 23) he is batting .407 (22×54) with 4 runs scored, 1 double and 7 RBI. -> OF Denny Almonte currently has a 8-game hit streak with 5 multi-hit games, batting .438 (14×32) with 6 runs scored, 2 doubles, 1 home run and 2 RBI. He has also hit safely in 11 of his last 12 games, batting .432 (19×44) with 9 runs scored, 4 doubles, 2 home runs and 7 RBI. Tonight, Jackson’s game with Jacksonville was suspended in the 4th inning thanks in part to part torrential downpours and storms. I have seen more rain the past 3 days than I have the first 2 months of the season. With a (semi) night off, I wanted to make a post on what everyone is thinking right now. When is Danny Hultzen going to be promoted. There is no doubt in anyone’s mind that he is ready for a new level. 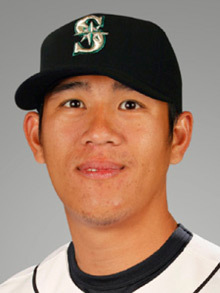 The way that Hultzen is pitching now, he would not be challenged even in Triple-A. Will he face a few more veteran hitters in Tacoma? Yes. Will he pass the test with flying colors? Yes. There has not been a pitcher in the Southern League since Clayton Kershaw or David Price to draw such attention or adoration. 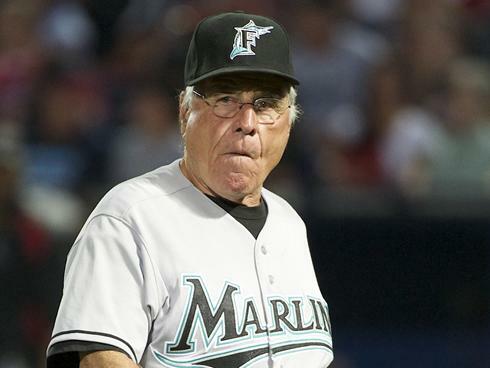 Today Jack McKeon sought me out in the press box to talk about Hultzen. The former NL Manager of the Year was blown away with his mound presence and command. He was my guest tonight on the Generals broadcast and you can listen to the interview where we discuss Hultzen, his future and who he reminds him of. The first 2 minutes or so is about his career, so you can skip through that if you want. Sitting through a rain delay is pretty awesome. Listening to old stories and talking about the 2003 Marlins is pretty priceless. One thing being around Danny for half a season I have learned is he is never satisfied. Whether he strikes out 12 or throws 8 scoreless innings. He never is comfortable. At 22 years old he is well beyond his years and is a major leaguer in every part of the game. He sprints on and off the field, wears the socks up high and is an old school competitor. If Thursday is his final start in a Jackson uniform (which I think it will be), then it has been a privilege to watch him pitch. TODAY’S GAME: With the series tied at 1-1, the Generals face Jacksonville tonight in game three of the five-game set at the Baseball Grounds of Jacksonville. 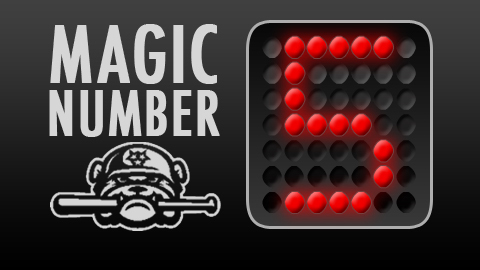 The Generals hold a 4.5 game lead in the division and magic number to win first half is now 5. GENERALS RECAP: Danny Hultzen and Carter Capps combined to face just one above the minimum on Friday night as the Generals defeated Jacksonville, 1-0. Hultzen tossed a season-high 8.0 shutout innings, upping his scoreless innings streak to 22.2 innings pitched (the longest by any pitcher this season). The Generals logged their 7th shutout of the season and lowered the magic number to 5 games to clinch a 1st half North Division crown. Hultzen allowed just 2 soft singles, while striking out 8 and walking 1 in the start, lowering his league leading ERA to1.28. The All-Star lefty is now 7-3 and has won his last 3 starts. No Jacksonville batter reached 2nd base in the game and only one runner was left on base thanks to Jackson’s 2 double plays turned. The Generals tallied their lone run in the top of the 1st on an RBI double from Denny Almonte that scored Nick Franklin from first. Hultzen had thrown 93 pitches after 8.0 innings, but Capps was called upon in the 9th and he struck out 2 of 3 batters to earn his 7th save this season. Jesus Sucre was the only player on either side who logged a multi-hit game, finishing 2-for-4. COMBINED NO HITTER: Seattle threw the 10th combined no-hitter in Major League history last night against the Dodgers as former Generals Stephen Pryor (W), and Tom Wilhelmsen (S) were a part of. They combined with Kevin Millwood, Charlie Furbush, Lucas Luetge, and Brandon League to tie for the most pitchers used in a combined no-hitter (6)… It was the 3rd no-hitter in Mariner history, first since Chris Bosio, 4/22/1993 vs. Boston… the first no-hitter in Mariners history was Randy Johnson, 6/2/1990 vs. Detroit. ELITE EIGHT ALL-STARS: Eight players from the Generals will represent the North Division in the 2012 Southern League All-Star Game at Smokies Park, the most of any team in the league. Pitchers Carter Capps, Danny Hultzen,Bobby LaFromboise (added today) and Taijuan Walker were all named to the North pitching staff after leading Jackson to a league-leading team ERA this season. Catcher Jesus Sucre, infielder Nick Franklin, and outfielders Denny Almonte and Joe Dunigan were also named to the squad. 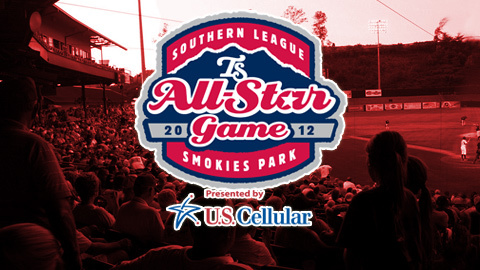 The 2012 All-Star Game will played on Tuesday, June 16 at Smokies Park in Kodak, TN, with first pitch at 7:15 p.m. EST.